For open-air driving you can’t beat a drop-top, but be sure you’re looking at the safest convertibles when you shop new or used. While the number of popular convertibles available from several automakers continues to increase (hey, they’re hot-looking and attract customers into the showroom), only three have made it as Top Safety Picks from the Insurance Institute for Highway Safety (IIHS) for 2007-2009. In order to qualify as a Top Safety Pick, the convertibles had to have: standard rollbars designed to preserve headroom if the vehicle rolls over in a crash and standard electronic stability control (ESC) to intervene when the car is about to go into a skid. Here, then, are our top three choices for Safest Convertibles, along with comments from automotive experts to help you decide if one of them is right for you. Saab 9-3 Convertible – MSN Autos writer Ann Job listed the 2006-2007 Saab 9-3 Convertible in a story of the first IIHS crash test ratings on convertibles. 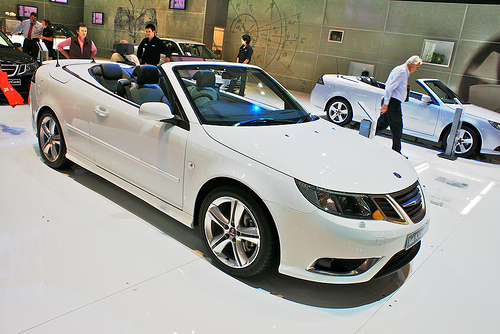 Saab 9-3 convertible earned an IIHS Top Safety Pick for 2007, 2008 and 2009 (the only years convertibles were tested). Saab 9-3 safety features include ESC and traction control, DynaCage with active rollover protection, side-impact airbags, front seat active head restraints, and anti-lock brakes. Tom Keane of Motor Matters, Minneapolis Star-Tribune writes that “Saab 9-3 offers a lot more than just a convertible top for fair-weather driving. I would feel as comfortable in the Saab 9-3 convertible year-round as I would with any other front-wheel-drive sedan.” U.S. News and World Report calls 9-3 a “sporty performer with a polished exterior,” but cites low gas mileage as a negative. Volkswagen Eos KOMFORT – Kelley Blue Book lists Volkswagen Eos KOMFORT hard top as one of the top 10 researched 2010 convertibles. In J.D. Power and Associates quality ratings, VW Eos KOMFORT 2-door convertible earned a better than average rating. Eos KOMFORT also boasts an above average IntelliChoice rating. Eos features standard four-wheel antilock brakes (with brake assist), traction control and ESC, front, side-impact and side-head-curtain airbags, and roll bars that automatically pop-up if rollover is detected. U.S. News and World Report says Eos “is both a fun convertible and a practical daily driver for those who don’t have to haul much in the way of cargo or passengers.” Pros include retractable hardtop with sunroof and innovative automatic transmission. Cons include cramped interior and lack of cargo space (compared to ragtop convertibles). Volvo C70 – U.S. News and World Report says Volvo C70 (scheduled for major redesign in 2011) “is an aging but still attractive hardtop convertible that should meet the needs of casual drivers…but the C70 still offers a strong safety record and a sharply-styled, comfortable cabin.” One of the more expensive midsize cars, C70 has only adequate cargo space. Car and Driver comments, “C70 is high on style but lacking in driving excitement. The folding metal top gives the security of a coupe and year-round usability, but it lacks the driver appeal of a BMW, Audi or Infiniti convertible.” Standout safety features include anti-whiplash headrest at all four seating positions, full-length side-curtain airbags, and a rollover protection system that extends roll bars behind rear passenger seats when sensors detect impending rollover. Other safest convertibles to consider include Audi A4 Cabriolet, BMW Z4 35i, Chevrolet Corvette, Chrysler Sebring, Mazda Miata MX-5 SPORT, and Mitsubishi Eclipse Spyder.